In this construction video tutorial, one will learn how to make calculation for finding out the volume of Trapezoidal Footing at construction site. 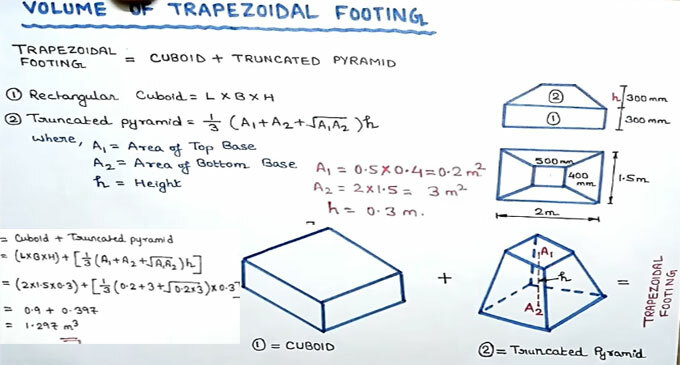 Trapezoidal footing is formed by combining cuboid & truncated pyramid. Cuboid may be rectangular or square in shape. A special case of footings is the trapezoidal footing that may be utilized to bear two columns of unbalanced loads when distance outside the column of the massive load is restricted. A trapezoidal footing is applied in such a manner that the center of gravity of the footing is located under the outcome of the loads. In that order, the distribution of contact pressure will be consistent. Now, it is required to find out the volume of rectangular cuboid and truncated pyramid individually.